Projects Abroad is one of the largest volunteer abroad organizations in the world. Founded in 1992, Projects Abroad sends 10,000 people abroad each year on a variety of service projects and internships overseas. All participants receive unparalleled in-country support from their full-time, professional staff to ensure that the experience is safe, worthwhile and fun. Volunteer overseas or intern abroad in Africa, Asia, Europe, or Latin America. Projects Abroad offers overseas voluntary work placements including teaching, care, conservation & environment, medicine & healthcare, journalism, law & human rights, international development, business, and more. Volunteer overseas with Projects Abroad, as a great opportunity to put your time into a meaningful and rewarding programme. Projects Abroad offers a wide range of service trips in various fields of interest, with placements in more than 30 destination countries around the world. On an overseas volunteering programme you can impact communities and the environment in various areas of need, such as caring for children, teaching English, or protecting wildlife. With more than 300 trained staff in their destinations and over a thousand different placements to choose from, Projects Abroad is one of the leading volunteer organizations in the world. But their impact will not be felt without the dedicated overseas volunteer work completed by their participants of all ages and backgrounds, who total more than 5,000 each year. 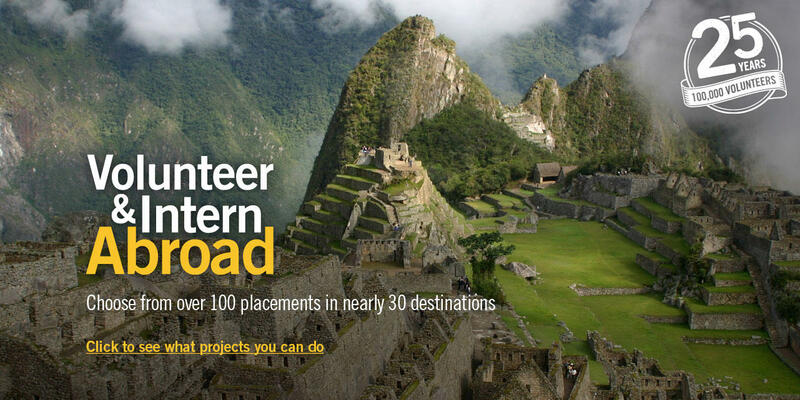 You can volunteer overseas in Africa, Asia, Europe, Latin America & the Caribbean, Central America, and the South Pacific. For more information please follow this link to the How it Works page on their website. Boost your resume and gain skills and real world experience on one of Projects Abroad’s international internships. Their internships abroad allow you to contribute to sustainable development and bring a more cross-cultural understanding to the world. Projects Abroad offers internships in more than 30 developing countries around the world, where you can gain valuable experience by working alongside qualified professionals in your chosen field. Projects Abroad’s local staff will work closely with you to determine which specific internship placement gives you the most valuable learning experience and provides the greatest benefit in the country. If you are 15 to 18 years old and enrolled in full-time education you can join Projects Abroad on a High School Special. Each project follows a schedule of taught sessions, hands-on and observational work, as well as evening activities and weekend excursions. Lasting two to four weeks, these programs are designed to make the most of your short time abroad while contributing to your community service credit requirements or college applications. Read more about the structure of High School Specials, how travel arrangements work, or explore below the variety of High School Specials projects available. Every year, thousands of High School Special volunteers actively make a difference around the world. During their time abroad, they contribute towards achieving long-term goals and make a long-lasting positive impact on the communities where they work. If you want to know more about their achievements, read Projects Abroad’s 2017 High School Specials Impact Report. With spring warming the earth and flowers beginning to bloom, March is the ideal time for a family picnic. So, it is time to put down your phones and let nature’s glorious blues and greens revitalize your eyes while you savor shared moments in the countryside, and help fundraise for a great cause! 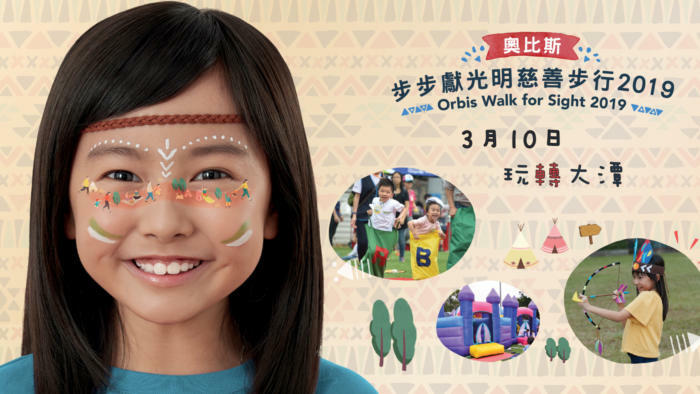 Incredibly, 2019 marks the 20th anniversary since Orbis’ first-ever Walk for Sight. Orbis invites you to join them in helping the world’s needlessly blind and to see the day’s event filled with nature’s beauty, the simplicity of happiness, and the vibrant colors their “Indiana’s Adventure” theme will provide. Carnival: Relax with a tasty sandwich box, snack and drinks in the countryside, enjoy stage performances, blindfold experience and games after your walk! About Orbis: Orbis is the result of a unique and lasting alliance forged between the medical and aviation industries. In the 1970s, leaders of these two industries came together to create the plan that led to the foundation of Orbis. They knew that the high costs of tuition, international travel and accommodations prevented most doctors and nurses in low-income countries from participating in overseas training programs. Even when they could afford to study abroad, their opportunity for direct clinical experience was limited because strict licensing laws often prevented them from performing surgery. The solution was a mobile teaching hospital. With a fully equipped hospital on board an airplane, doctors trained in the latest ophthalmic techniques, including pediatric ophthalmology, could bring their surgical knowledge and skills to doctors in low-income countries through hands-on training and lectures. A grant from USAID and funds from private donors enabled Orbis to successfully convert a DC-8 plane into a fully functional teaching eye hospital. As replacement parts for the original DC-8 plane became more difficult and expensive to obtain, it became clear that a newer, larger aircraft was needed. In 1992, after a major fundraising appeal, Orbis purchased a wide-body DC-10 to replace the DC-8. Within two years, Orbis had converted the plane into an eye surgery hospital. Orbis set up office in Hong Kong in 1985. Today, the office has a staff of some 45 whose main goal is to prevent blindness worldwide by raising funds and increasing awareness of eye health issues. Recent years have seen the office recruiting numerous local ophthalmologists to Orbis’ global sight-saving team. Their role is to visit developing countries where they teach their skills to local counterparts who then share their newfound abilities with their colleagues. The TWGHs Charity Challenge Race is a large-scale race to raise funds for TWGHs Development Fund of Kwong Wah Hospital Redevelopment Project. Race Format: Each team player/individual player begins at the starting point, leaping over 8 different obstacle points along the 2.5 kilometre race course to the finishing point. If player fails at the obstacle point or violates the race rules, 60 seconds will be counted as penalty. Player is required to wear a timer inside the penalty zone until penalty time is over. No interference of the timer is allowed. About Kwong Wah Hospital: Kwong Wah Hospital, established by the Tung Wah Group of Hospitals in 1911, is one of the acute hospitals in Kowloon Central Cluster managed by the Hospital Authority. After redevelopment, the hospital will provide a patient-oriented environment with the capacity and capability to deliver holistic and seamless healthcare services, in collaboration with other hospitals within the cluster. – Retain its role as acute hospital and aim to provide about 500 additional beds and 10 additional operation theatres. – Emergency Services – Provision of adequate isolation facilities and 24-hour CT Scan services, and expansion of Emergency and Observation ward. – Outpatient Services – Consultation rooms for specialist out-patient will be expanded from 44 to around 100. – Day Care Medical Services – Provision of one-stop multi-disciplinary services to patients with non-acute conditions at an ambulatory care centre, facilitating patients to receive medical treatments. – New Medical Oncology Services – Including front-line management, consultation services and chemotherapy programmes. – By expansion of Chinese and Western Medicine Integration Services so as to provide comprehensive Chinese and Western Medicine Hospital Services. As a result, estimates of as high as 60% of the adult population is infected with HIV in many villages. The exact extent of the tragedy remains unknown. Dr. Gao Yao Jie, an activist for AIDS patients in Henan Province, estimates that up to one million people are infected in Henan province alone. Founded in 1998, the Chi Heng Foundation is a charity registered and based in Hong Kong with offices in Henan, Anhui, Beijing, Shanghai and Guangzhou. It is a non-government organization whose programs are funded by private donors, business, and partner NGOs. 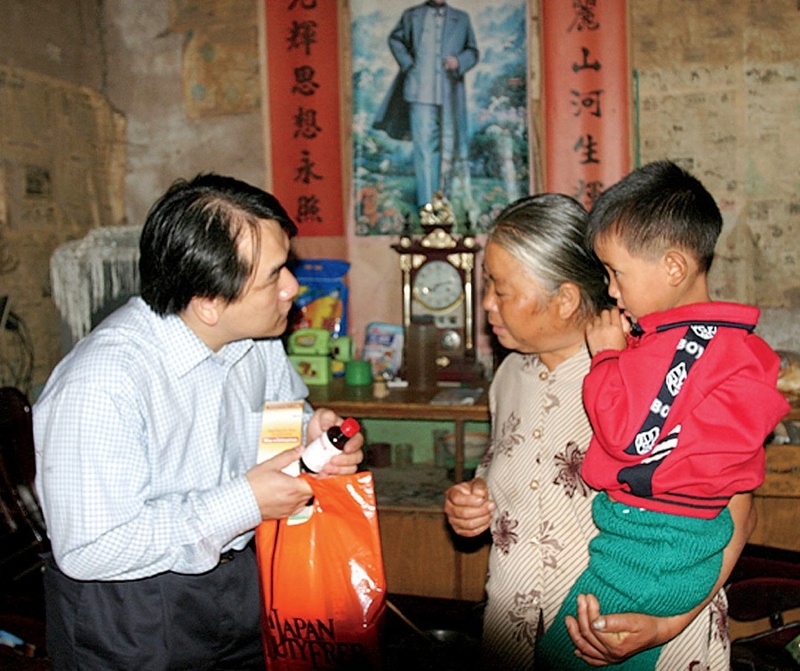 “Chi Heng” means “wisdom in action”, and at CHF they believe they must use their knowledge to help people in need. With this in mind, CHF moves from village to village throughout Central China offering help to all children affected by AIDS, thereby ensuring that no child is excluded and each child’s needs are fully understood. CHF primarily focuses on paying for the children’s education and living expenses, making sure all funds are delivered directly to schools and programs by their staff. CHF does not operate orphanages or foster homes. Instead, local relatives often take in the children, allowing them to continue to grow up in their native villages. To further decrease their sense of social stigma and isolation, CHF places the children in schools that purposefully integrate the orphans with children not affected by HIV/AIDS. These efforts aim to give orphans a stronger sense of community and belonging. CHF promises a long-term commitment to helping children not only complete their education but also receive dependable, comprehensive support. If you would like to volunteer, please click here to complete the online volunteer registration form. Intern: Chi Heng offers summer, fall, and spring semester internships, as well as yearlong programs for recent university grads, undergraduates, and graduate students. Internships are unpaid, can be full or part-time, and are offered in the Beijing, Shanghai, and Hong Kong offices. Office hours are Monday-Friday, 9am to 6pm. Placement is decided upon based on availability and the needs of each office. Start and end dates are flexible, depending on the needs of each intern. Applicants must demonstrate a strong command of English; knowledge of Mandarin or Cantonese a plus. Applicants should note that though they will specialize in a particular area, they will be involved in a variety of tasks depending on the needs and activities of the organization. Applicants must submit a resume, cover letter, and completed Chi Heng Foundation Application Form to CHF. Incomplete applications will not be considered. – Why would you like to work with the Chi Heng Foundation? – What are your relevant skills and experiences? – How do they pertain to Chi Heng’s work? Join Matilda International Hospital to celebrate Christmas with friends and family in their spectacular heritage site this December. Christmas choirs, Father Christmas and snowmen will star in the Carols by Candlelight Charity Event at the Matilda International Hospital at 6-8pm on Tuesday, 4 December 2018. Admission to the charity event is free, and open to all. It is a festive evening, a time to enjoy being close to loved ones, listen to carols, savour specialty Christmas foods, and embrace the true spirit of giving at Christmas. All sales proceeds will go to the Matilda Children’s Foundation, which provides life-changing surgeries to children with no other means of assistance. 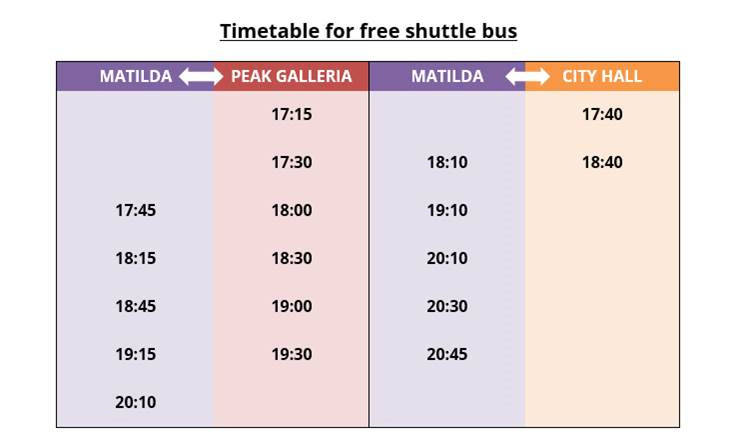 A free shuttle bus runs between the Peak Galleria (Public Transport Terminus) and Matilda International Hospital at the Peak from 5:15pm to 8:10pm on 4 December (Tuesday). Additional shuttle buses will depart from hospital to Central after the event. About Matilda Children’s Foundation : In 2003 Matilda International Hospital established the Matilda Children’s Foundation to raise money for life-changing surgery for children in need. Matilda doctors and teams volunteer to help the foundation, donating time, expertise, money and resources for surgery. The charity has provided treatment and care for over 60 children from the region. Every dollar raised goes to the Foundation. 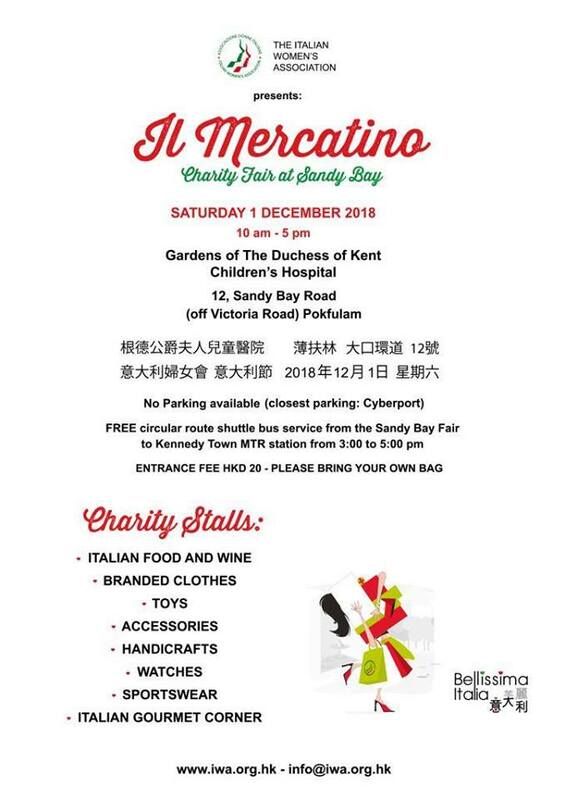 Mark your calendars, on Saturday, 1 December 1, The Italian Women’s Association has organized the 35th Edition of the Italian Day at Sandy Bay in the gardens of The Duchess of Kent Children’s Hospital! Head on over with the family and help raise money as all proceeds raised during this event will go directly to the Duchess of Kent Children’s Hospital and other carefully selected Hong Kong Charity Associations. * Sportswear and so much more! You last chance to pick up some great Christmas presents, delicious Italian delicacies with proceeds going to great causes. Price: Entrance fee is HK$20 and there is, unfortunately, no parking available, the closest parking is in Cyberport. For more information on the event click here. About Italian Women’s Association: The Italian Women’s Association (IWA) is a non-profit organization, registered in Hong Kong since 1996, which operates in the field of charity. The Association welcomes Italian women or not, interested in friendship, the Italian language, culture and the various activities that they offer every month. They organize many events: social gatherings and cultural activities, playgroups for children, excursions, lectures, ‘coffee mornings’, etc. Through these events, all members – and the ladies recently arrived in Hong Kong – are able to meet regularly in a welcoming atmosphere. In addition, the IWA also often collaborates with various organizations and other associations of women in Hong Kong. A little over a month before Christmas, spare a thought for the various charities in Hong Kong, who still need to achieve their fundraising goals for the year. Here’s a great way to look at three and make a donation. 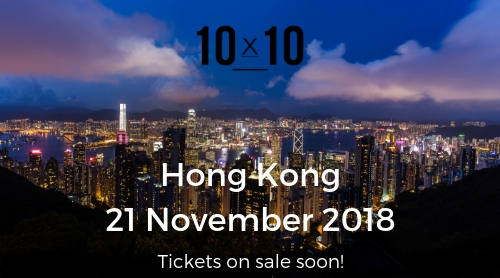 Please join the fourth installment of 10×10 Hong Kong in support of 3 young and unique grassroots charities! If you would like to attend the event, please buy a ticket by clicking on the PLEDGE NOW button by following this link and selecting the amount of your pledge (minimum $1,000 pledge required for an event ticket, options up to $3,000 also available). If you want to purchase multiple event tickets, please just select the Pledge amount per ticket). Your Pledge purchase is converted to Charity dollars on the night, and it is 100% tax deductible. If you are unable to attend on the night but would still like to support the event, you may still make a pledge to the charities by entering an amount of your choice. – 10 volunteer committee members organise a charity event (1 x venue, 3 x charities, 3 x dragons, drinks & canapes). – Each committee member invites at least 10 of their friends, family and colleagues to attend the event (10 x 10… get it?). Each guest pledges HK$1,000 or more to attend the event, creating a pool of at least HK$100,000. – Upon arrival at the event, each attendee is given ‘Charity Dollars’ equal to the value of their ‘Pledge’. – After drinks, snacks and networking, attendees are seated to watch the 3 charities pitch their unique cause, and listen to the panel of Dragons question the speakers on their business model, impact and future goals. The audience also have an opportunity to ask questions of the charities. – After the pitches and friendly interrogation from the Dragons, each attendee then decides which charity they want to give their ‘Charity Dollars’ to. – Charities receive 100% of the funds raised (minus a 10% project fee to 10×10 to cover admin and overhead costs). – Guests can opt to receive a tax deductible receipt from the charity 4-6 weeks after the event. Your Pledges will be available for collection at the venue on the night of the event. For a HK$1000 pledge, you’ll receive two HK$500 charity vouchers which you can allocate across the charities however you please. Price: Minimum $1,000 pledge required for an event ticket, options up to $3,000 also available. If you want to purchase multiple event tickets, please just select the Pledge amount per ticket. Your Pledge purchase is converted to Charity dollars on the night, and it is 100% tax deductible. NOTE: PAYMENT BY VISA / MASTERCARD ONLY. About Sprouts Foundation: Sprouts Foundation aims to break the cycle of inter-generational poverty, by providing education programs to some of the lowest-income families in Hong Kong and elsewhere. Our small-group, activity-based classes focus on enhancing children’s self-esteem and their interest in learning, by building skills relevant both to work and life. These include English and IT proficiency, as well as a wide range of professional capabilities including entrepreneurship. Combined with corporate visits and a variety of weekend outings, we help open our students’ eyes to the world and the many opportunities around them, and give them the capacity and confidence to reach out more ambitiously. About Rooftop Republic: Rooftop Republic Foundation is dedicated to building inclusive communities around urban farming and sustainable living in Hong Kong. About The Brightly Project: Lulio targets to prevent student suicides by empowering schools and their teachers to feel more confident, capable and knowledgeable in their efforts to proactively support students at risk of suicide. About 10×10: Back in 2013 in Sydney Australia, 3 passionate and highly successful social entrepreneurs Laurence Marshbaum, Nina Skryzynski and Jenny Newmarch shared a vision that everyone can make a difference by getting involved with philanthropy. They saw that young professionals like themselves wanted to live purpose driven lives and to give back to their local communities. However they lacked the time, knowledge and framework to do so in a way that made a difference. On the flipside grassroots for purpose organisations (not for profits) found it hard to find financial support and volunteers to sustain their work. Laurence, Jenny and Nina got together 10 friends and organised an event with each friend inviting 10 of their friends and they lined up 3 charities to attend. That night they raised $ 11,000. The night was a success and the concept of 10×10 was born. 10×10 has started a movement worldwide and aims to empower the next generation of giving. 10×10 is successfully building a community of likeminded young individuals who are inspired to come together to support innovative grassroots charities in a fun and engaging way. Their innovative model and technology platform makes the 10×10 concept simple, replicable and low cost. 10×10 committee members love being part of the 10×10 experience with over 94% recommending it to friends – they build new networks and gain skills in leadership and teamwork. More importantly for them their 10×10 experience ignites a passion for philanthropy and this translates to a whole new generation of people giving more from a young age. For participating charities, 10×10 offers an innovative and fresh way of directly engaging with a young supporter base. Many come away from an event being provided not just with financial help but also with a valuable network of involved professionals who can assist with expertise and connections.